Dear Tan, thank you always for coming to my blog. I am HAPPY to hear from you always. Wow---,such a cute pon pon fowers !!! I love your bright colors and pon pon flowers!! !p(^o^)q"""
Also ...alphabet " O ", those pink and yellow were made by punch ??? I love it !!! Looking forward to see your next creation again !!! (^.^)v"""
Totally sweet and wonderfully bright! Your fringe flowers are SO lovely!! This card is SO creative and fun. I love it! wow I love these vibrant colors...this card is so amazing...love it.. Simple yet beautiful! love the felt flower. 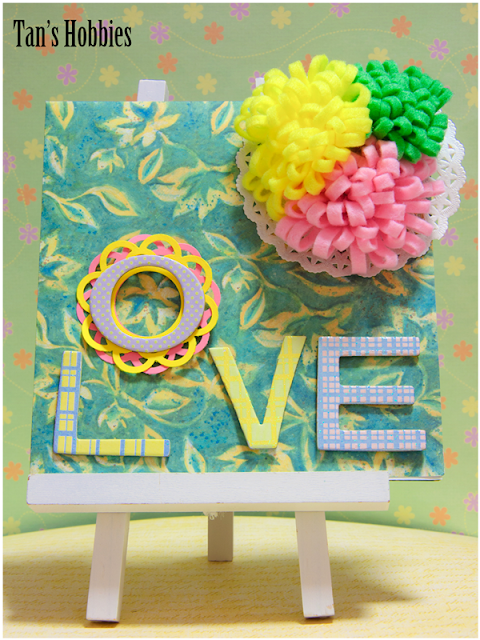 this is so adorable, love the bright colors, very cheerful!!! Simply adorable!! I love the adorable flower and the way you did the lettering :-) Have a wonderful weekend!! Wonderful card!!! I love the felt flowers, awesome idea.Excellent job!! How cute is this! I love it! Well you know how much I loved your last card - your newest one is gorgeous!! I love the colors. How creative you are!! I see some of my favorite people have been here to visit. Thanks a ton for visiting my blog and leaving such a wonderful compliment. You are indeed too kind!! I shall be watching, your are extremely creative!! I can tell you this.....I am in LOVE with this card and those fabulous felt flowers!!!! Lovely bright card and great flowers. this is so pretty. Do mind to share how to make this item?